While running on top of the Great Wall of China last spring, I suddenly feel as if I have been transported into a dream world, striding over ancient cobblestones along a passageway through time. 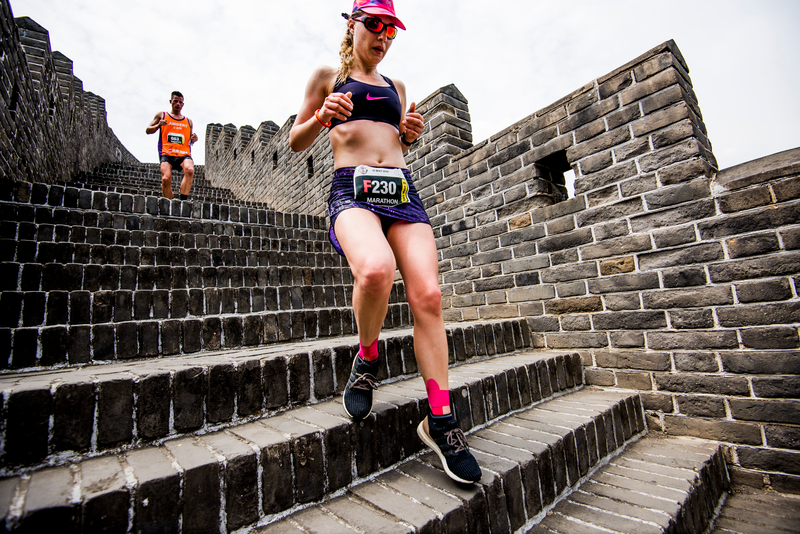 Maneuvering my way up and down sections of the massive stone structure during The Great Wall Marathon, I am fully engaged in the race, yet I can’t ignore the ethereal connection to the unfathomably long history of the place where I am running. The Great Wall of China is one of the Wonders of the World, something I learned about in my youth but never truly imagined I’d ever see—let alone run a race on it. It was built to protect ancient Chinese states against raids from invading nomadic tribes, and yet here I was running up and down 5,164 stone steps in a quest to reach the finish line of a marathon. The race is held on portions of the Huangyaguan section of the Great Wall, about 75 miles east of Beijing in the mountainous region known as Yellow Cliff Pass. While oldest parts of the wall were built in the 7th century BC, the Huangyaguan section was built in the 6th century AD during the Northern Qi Dynasty and reinforced in the 1500s during the Ming Dynasty. It greatly damaged in numerous battles in the ensuing years and eventually rebuilt and restored for preservation and tourism in 1984. So how is it that there is a marathon on the wall? It was conceived and started in 1999 by Danish entrepreneur Søren Rasmussen as a means to pair running with an immersive cultural experience. 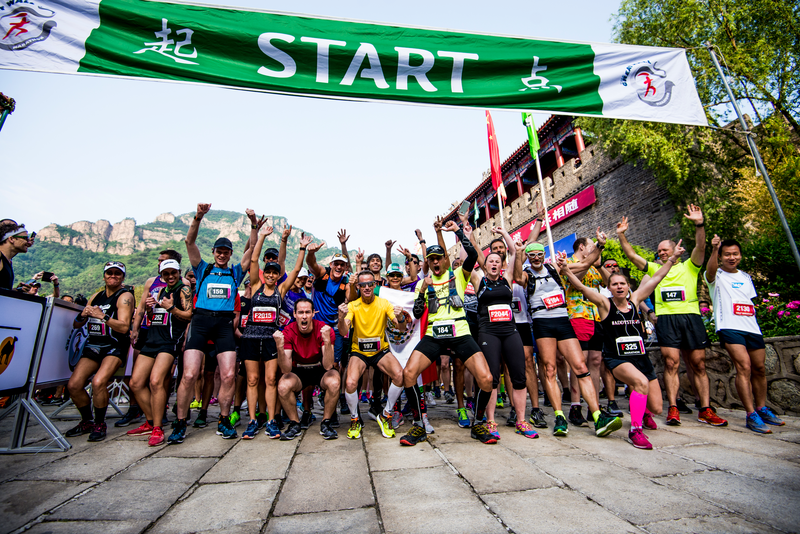 Since then, The Great Wall Marathon has become known as one of the world’s most spectacular running race experiences, not to mention one of its most challenging. Only a portion of the race is actually run on top of the wall, but the parts of the course that run adjacent to it or within view of it on paved and gravel roads and trails are culturally relevant and challenging in their own right. It became clear before I even started the race that you don’t need to be running atop the wall to feel and understand its power, history and significance. But running on it was definitely an otherworldly experience. As with Stonehenge in England, Machu Picchu in Peru, the Egyptian Pyramids and other ancient man-made wonders of the world, I have been long intrigued by the incomprehensible notion that such a massive structure could have been built so many centuries ago without any modern machinery. I was fascinated to learn that rice flour was one of the main components in the mortar holding some of the stone blocks in place and to consider the mythical notion that parts of the wall can be seen from outer space. But it wasn’t until I ran The Great Wall Marathon that I got a much truer understanding of the massive edifice that still stretches more than 5,500 miles across China. Running on the wall provided many transcendent moments unlike any I’d ever experienced before in a marathon, and it immediately connected me to both the ancient civilizations that conceived, built and maintained the wall back to the growing trend of adventure running races in some of the world’s most amazing places. The mountainous scenery adjacent to the wall was breathtaking, the cultural highlights were thought-provoking and the running was a one-of-a-kind experience—all aspects Rasmussen knew would make for an extraordinary event and eventually become known as a bucket-list event for runners around the world. That’s exactly what I kept asking myself! 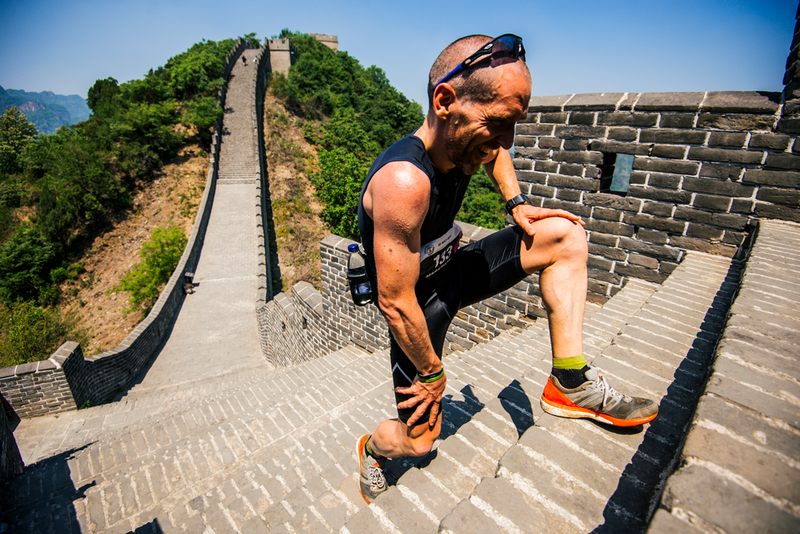 Thanks in part to Rasmussen’s creative foresight, running a marathon certainly isn’t what it used to be and after running The Great Wall Marathon it never will be again. It used to be that running a marathon was a personal quest to see how fast you could complete 26.2 miles. Or if you could complete it. Then it became about running a race for a charity. Or in a costume. Or in a far away city like New York or Boston, London, Tokyo or Berlin. When Rasmussen started The Great Wall Marathon, he took it one step further by pioneering the idea of running a marathon in one of the world’s most unique places. Running a race on and around one of the Wonders of the World is still a rare and special opportunity, one that represents a powerful, growing trend in running. Now there are running races at the ancient city of Petra, among the temples and pagodas of Bagan, across African game reserves adjacent to the Taj Mahal and along the historic pathway to Machu Picchu. But it was the original Great Wall Marathon back in 1999 that started the trend. The 2019 edition of the race on May 18 will mark the 20th anniversary of its inception, clear proof that Rasumussen knew what he was talking about. At the first event Rasmussen organized in 1999, the field was comprised of 350 runners from Denmark. But by the next year word had gotten out and runners from eight different countries tested their mettle on the Great Wall. 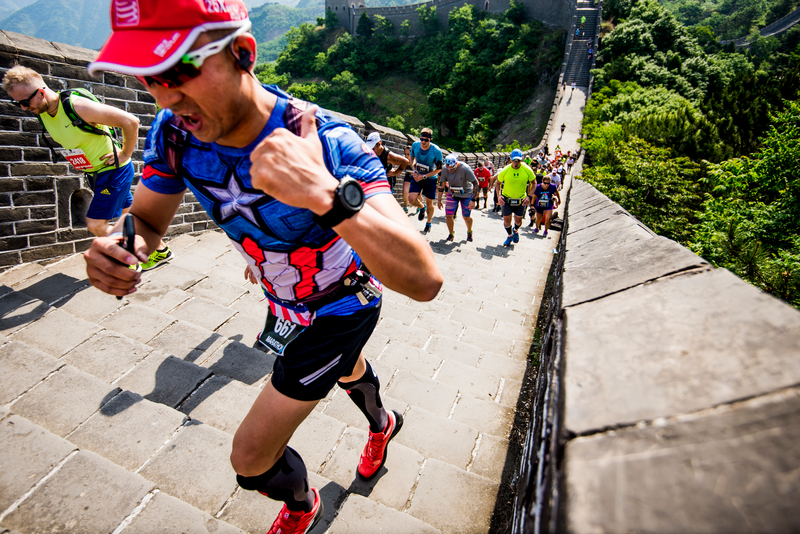 While many of the runners who sign up each year now are Chinese citizens hailing from the densely populated areas near Beijing—mostly novice runners who are eager to participate in a public display of fitness and fun—The Great Wall Marathon has become a distinctively international flair. Before I started the race, I was comforted to hear the chit-chat of English-speaking runners among the 2,250 or so participants, including many Brit and Aussie ex-pats from Hong Kong, as well as plenty of American runners visiting from the U.S.
As the start time drew near, the energy increased dramatically and the local flavor really came to life. As a Beijing running group posed for a shot under the starting line banner, two young Chinese women dressed in identical pink-and-orange running outfits embraced in a comforting pre-run hug and a middle-aged local man wearing a New York Yankees cap shot me a thumb’s up and a reassuring nod. The race started in an ancient courtyard surrounded by four historic temples, then sent runners on a steep 5K ascent to the first section of the wall. Gasping runners trudged single file on the stair steps of the path as it meandered upward several hundred feet through the foothill terrain before topping out at one of the many brick beacon towers built into the wall every few hundred meters or so. In ancient times, the towers housed guards who would pass military messages along the wall and create smoke-signal alarms if intruders were approaching. In the race, the towers served as aid stations—offering water, electrolyte drinks, bananas and cherry tomatoes—but all were unique obstacles for the runners to maneuver through, most featuring shadowy labyrinth-like stairwells or breath-sucking steep steps the led back out to the main sections of the wall. Even if mentally and culturally enlightening, running on the Great Wall is no easy task. In fact it’s more akin to running on rugged mountain trails in places than it is to running on a cobblestone road. While some sections of the wall are built from finely manicured granite blocks, there are sections with loose stones, rough gravel, broken steps and crumbling walls. There are some very steep sections of steps that many runners approach with a hand-over-hand climbing technique, and most of the level to slightly sloped sections have rough footing due to the jagged surface of the stone blocks. As much as I was eager to take in the scenery, I had to look precisely where I was running. At one point at about the 3K mark, I stubbed my foot on the protruding edge of a stone block and suddenly found myself twisting and flailing in an out-of-control panic that was sure to end in a face plant, bruised limbs and/or scuffed up hands and knees. But somehow—and I still don’t know how—I managed to control the fall with an inadvertent 360-degree spin and a secure, two-footed landing that I stuck like an Olympic gymnast. After passing through several guard towers and sections of the wall, runners exited down a stairway out to a trail that meandered through the trees and brush alongside the wall and eventually down to a gravel road along a creek drainage. As much as I enjoyed running on the wall, the easy-flowing natural terrain came as a welcome relief from the previous few miles of leg-burning grind on the stones. Soon we were on a large loop of gravel and dirt roads that wound through ancient villages where a few locals were out preparing small dusty field for the spring’s crops. Unlike big-city marathons around the world, the only other spectators at this race seemed to be the friends and families of the participants that were near the start/finish area and the many tourists on the wall. After about 25K of running away from the wall through several more villages, we were running up a steep dirt road back toward the wall. This time we ran a loop in a clockwise direction that gave me a glimpse of how impenetrable the sheer face of this massive stone obstacle must have been for would-be invaders. Finally, we reached another entrance and climbed up a thigh-busting staircase back to the top of the wall and the grind began again. My legs were fatigued, but my spirit was energized and I was inspired to keep chugging over this grand artifact. Before long, though, it was back to the dirt path where I encountered one more steep climb before a long downhill back to the finish inside a courtyard of temples. As I approached, it was irrelevant to me what my finishing time would be but it was clear that a marathon has never offered such a rich and wide-ranging experience. The running was challenging and invigorating, beautiful and painful. But it was the cultural immersion and the historical touchpoints that made it truly memorable. I loved reading this race description! It brought back vivid memories and thoughts of when I discovered the race. I ran it quite a few years ago and loved the experience!!! I would do it again in a flash, but I’d be better prepared!!! We ran this in 2017 and it was amazing. Really hot that day and definitely a difficult course, but the scenery was awesome and so was the support from local people along the part of the course not on the wall. I loved this race and all it’s challenges. Especially the Chinese rest rooms, which were the biggest challenges for me! I went with Marathon Tours and I can’t say enough about how easy the process was. If this is something you have dreamed about, DO IT! A true bucket list adventure race that must be experienced. 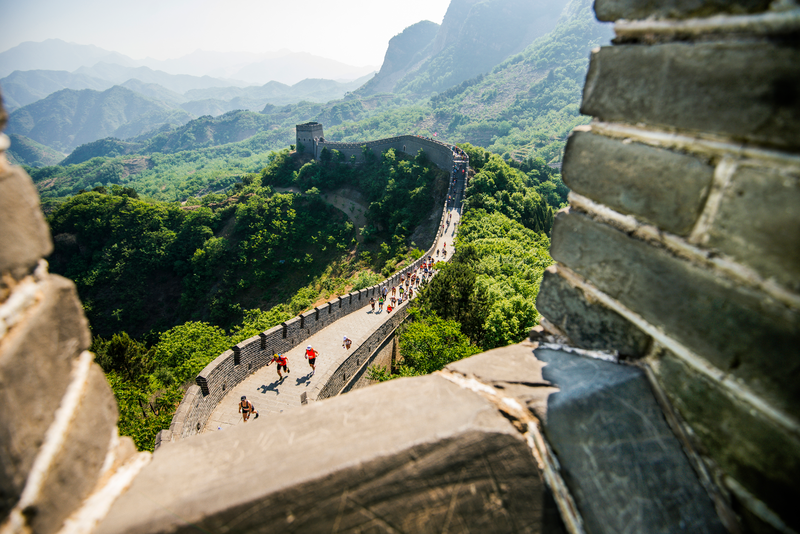 There are currently 3 or 4 marathon events that take place on the Great Wall of China. All of them are amazing. We do RunGreatWall.com, a once in a lifetime experience for any serious adventure runner. Although the luggage area is manned, depositing personal belongings in the area is entirely each runner’s responsibility and the Great Wall Marathon organisers are not responsible for loss or damage of personal belongings.